The Hongkong and Shanghai Hotels, Limited (HSH) is the oldest hotel company in Asia and one of the first to be listed on the Stock Exchange of Hong Kong, and to engaged in the ownership, development and management of prestigious hotel properties in Asia, the United States and Europe. The Kadoorie Family is HSH’s majority shareholder since the turn of the 20th century. Ms Katja Henke joined The Peninsula Bangkok in December 2012 as hotel manager. Her international career has taken her to France, England and the United States, where she worked as General Manager of Blantyre, a Relais & Châteaux property in Lenox, Massachusetts. 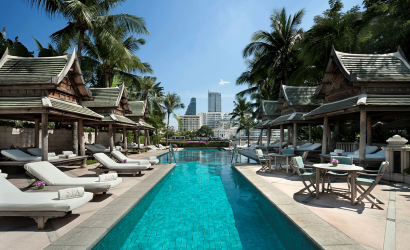 Since its opening in 1998, The Peninsula Bangkok occupies a world of its own on the banks of the Chao Phraya River, with many other worlds for guests to discover within. 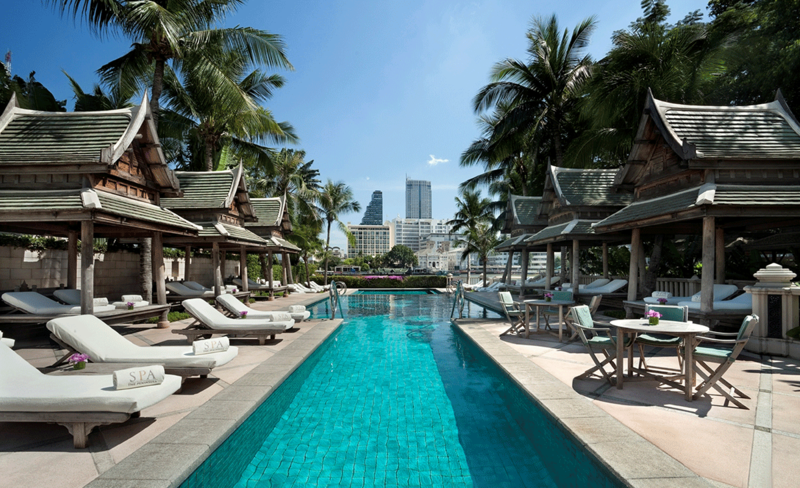 By blending east and west and historic with modern, The Peninsula Bangkok brings something fresh and truly exotic to the city’s five-star hotel scene. The 37-storey property features 370 guest rooms and suites, four restaurants with award-winning cuisine, The Peninsula Spa that is housed in a three-storey Thai style villa; and partners with the Group-owned Thai Country Club offering golf course access to its guests. 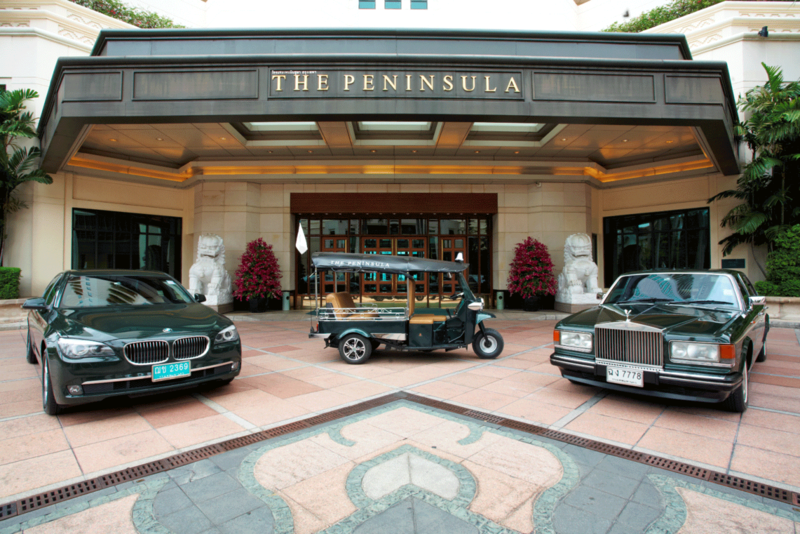 The Peninsula Bangkok is consistently recognised as one of the best hotels in Asia and garnered many awards over the years. In 2013, it celebrated its 15th anniversary of riverside heritage with the launch of newly renovated Lobby, Corporate Social Responsibility programme, Beauty Along The Chao Phraya River Photo Exhibition, special packages and online campaign. • The Peninsula Bangkok introduces an eclectic program from The Peninsula Academy which offers seven activities where guests can experience various key aspects of Thai culture, lifestyle, cuisine, art and history. • Varieties of luxurious and comfortable transportation include Helicopter, Rolls Royce, BMW Series 7, Tuk Tuk, and The Peninsula Boat to service for guests’ convenience in true Peninsula Style. Located alongside the scenic Chao Phraya River in Thonburi, close to the Sathorn Bridge and adjacent to the Saphan Taksin BTS Station, The Peninsula Bangkok is within easy access to the business and shopping districts of the city. It is also close to several of the city’s famous attractions such as the Grand Palace, Wat Arun (Temple of Dawn), Wat Pho (Temple of the Reclining Buddha), Dusit Zoo and many more. The Suvarnabhumi Airport and Don Muang Airport are just 45 minutes away from the hotel. • The Peninsula Bangkok displays 55 original contemporary art pieces throughout the hotel. • The pastry team produces more than 300 pieces of Peninsula Chocolates every day. • The hotel florist purchases more than 800 stems of different orchids and 50 pink and white lotuses every day. • The Peninsula Bangkok has 770 staff members and 102 of them have completed fifteenth years of service. • Paribatra, the exclusive helicopter lounge on the 37th floor of The Peninsula Bangkok, has 18 clocks displaying the local time in 18 different countries. • Junior Chef – A fun way to discover children’s cooking talents. • Thai Painting Class – A fun and easy art class. A total of 370 rooms from Superior (12) to Grand Deluxe Suite (50). • Five different luxuriously themed suites include The Peninsula Suite, The Duplex Suite, The Thai Suite, The Grand Terrace Suite, and The Terrace Suite. Each offers an uninterrupted view of the Chao Phraya River and distinctive Thai touches such as gleaming teak floors, rich silk furnishings, Asian art pieces, in-suite dining. • Mei Jiang – An award-wining Chinese restaurant serving fine Cantonese cuisine created by a resident Chinese Chef, and served in a serene and elegant setting. An extensive menu offers the best of Cantonese specialities including dim sum. In August 2013, Mei Jiang introduced its new Chefs’ Table experience with an exclusive peek into the secrets of the finest cuisine. The head chef and his team personally prepare lunch and dinner while providing guests a behind-the-scene glimpse of the kitchen. 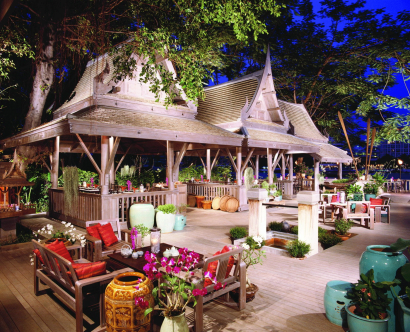 • Thiptara – Located on the banks of the Chao Phraya River and under a majestic banyan tree, Thiptara offers authentic Thai home-style dishes in a tropical garden setting. Thiptara has also expanded its array of dining options with the addition of its new lounge where guests are invited to socialise over cocktails and appetisers in an intimate sala reminiscent of a bygone era. The lounge is embellished with Thai artworks and artefacts. • River Cafe & Terrace – Whether it’s breakfast, lunch, dinner, dessert or drinks, River Cafe & Terrace offers a unique all-day dining experience. 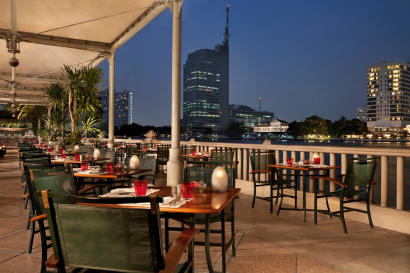 It offers al fresco or indoor dining with pristine views of the Chao Phraya River. • The Lobby – The Lobby is a lively meeting place serving breakfast, light meals, and the traditional Peninsula Afternoon Tea. It offers both indoor and outdoor seating on the riverfront terrace and live music in the afternoon. • The Pool – The perfect spot for enjoying light snacks and refreshments set in lush tropical surroundings. It features a three-tiered swimming pool and Jacuzzi area. 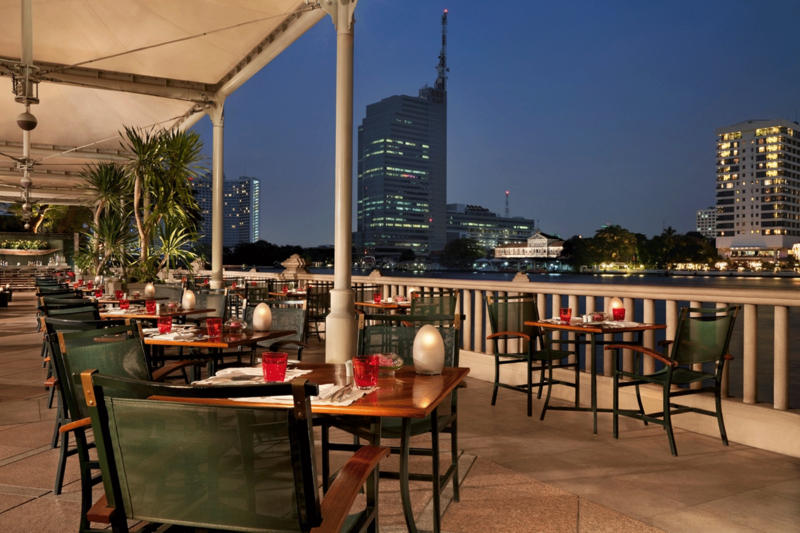 • The River Bar – The River Bar, located at the far end of the River Cafe & Terrace and Thiptara, provides unsurpassed views of Chao Phraya River. Relax, unwind and tempt the palate with refreshing cocktails and mixed drinks accompanied by light snacks. Located in a three-storey Thai colonial-style building adjacent to the hotel’s Fitness Centre, the 19,000-sq-ft or 1,774-sq-m The Peninsula Spa features 14 treatment rooms and four suites (two Private Spa Suites and two River Private Spa Suites), a Tea Lounge and Relaxation Rooms which together create a full-service oasis in the heart of the city. Treatments and packages are designed using European, Oriental and Ayurvedic philosophies for a new holistic experience. The Peninsula Spa includes exceptionally natural, high-quality skin care products to achieve outstanding results for energy, tranquillity and balance. The Peninsula Bangkok offers 7,595 sq ft (706 sq m) of versatile meeting and event space. Whether it’s an intimate meeting or a lavish gala, the space provides flexibility for every type of event. The Sakuntala Ballroom is an exceptional setting for private parties or business events. Featuring an ornately adorned steak lattice ceiling and exquisite crystal chandeliers, the ballroom can accommodate up to 600 guests in a variety of arrangements. For small events and meetings, the ballroom can be divided into separate sections. There are also six additional function rooms and a Business Centre, which has a private boardroom. • No. 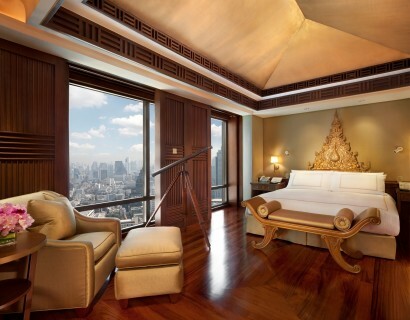 3 in Top Hotels by City (Bangkok), World’s Top Business Hotels, Travel + Leisure. • No. 1 in Top 15 Hotels in Thailand, Condé Nast Traveler Readers’ Choice Awards. • No. 75 in Top 100 Hotels in the World, Condé Nast Traveler Readers’ Choice Awards. • No. 2 in Top 5 City Hotels in Asia, 2013 World’s Best Service, Travel + Leisure. • No. 3 in Top 10 City Hotels Overall, 2013 World’s Best Service, Travel + Leisure. 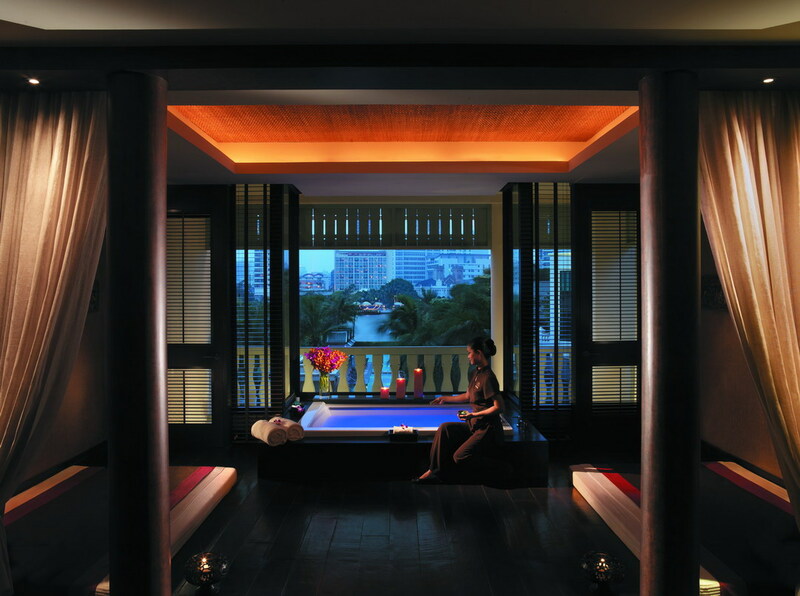 • Best Spa for The Peninsula Bangkok, World’s Global Travel Leisure Awards. 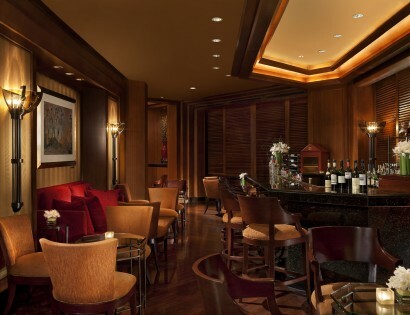 • The World’s Best Places to Stay for The Peninsula Bangkok, 2013 Gold List in Condé Nast Traveler. • No. 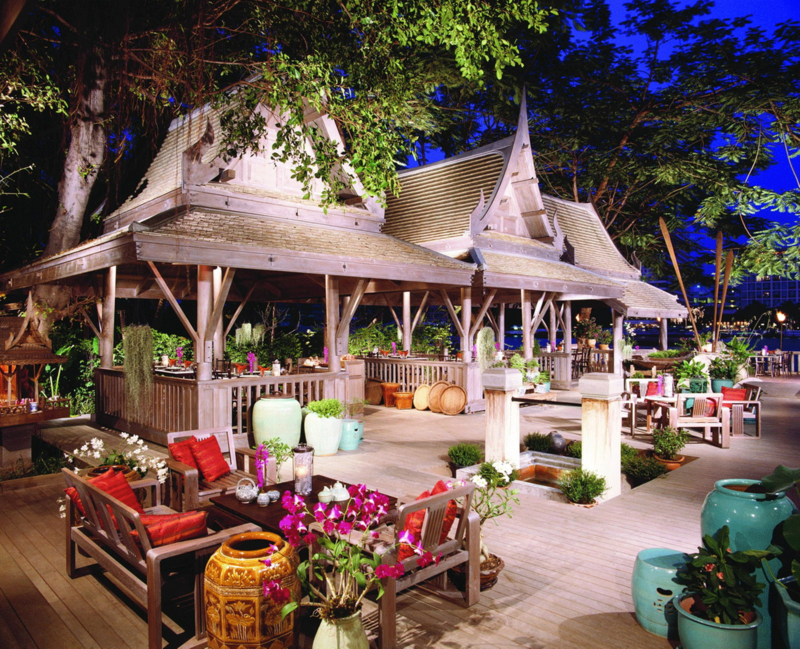 2 in Top 15 Hotels in Thailand, Readers’ Choice Awards, Condé Nast Traveler. • No. 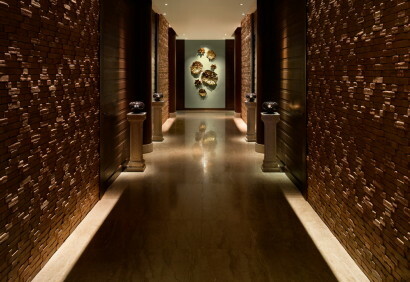 1 in Top City Hotels in Asia, 2012 World’s Best Awards, Travel + Leisure. • No. 11 in Top 100 Hotels Overall, 2012 World’s Best Awards, Travel + Leisure.